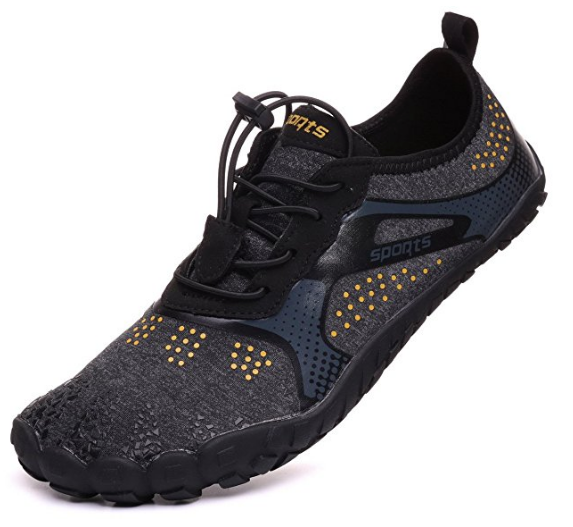 Welcome to Barefoot Running Shoes online store – For the largest selection of minimalist sportswear at the lowest prices on the Internet! Shoes that simulate barefoot runs yet protect the heels from sharp stones or glass are the latest evolution in footwear. They simulate natural shoeless running style – The way we were made to run by nature. Try them and you will love them forever as well as become our spokesperson for life – Thank you very much! Need proof that barefoot shoes are better than heavily cushioned shoes? The bottom line is that we evolved without shoes. It has been proven without doubt that running barefoot transfers critical information from the foot to the brain and spinal cord to coordinate movement of the rest of the body including ankles, knees, hips, upper body, etc. to help move in the most efficient manner without putting too much strain in the wrong areas. Cutting off that sensory information such as amount of impact at the heels while running, throws the rest of the body in disarray. This may be comparable to what our eyes would experience when we attempt to shoot in the dark! The human body has evolved the way it has evolved to operate in the most efficient manner – Running without shoes (or minimalist shoes that transfer most information from the foot to our brain while protecting against glass, sharp objects, etc)! Let us keep it that way and reduce injuries because it has also been proven that the most cushioned shoes cause most injuries while walking, jogging, or running. Try them, feel the difference, and you will become a believer – Just like we are!